백제의 옛 땅이었던 충청·전라도에는 부여 정림사지 오층석탑(국보 제9호)의 양식을 모방한 백제계 석탑이 몇 개 전하고 있는데 이 탑 역시 그런 계열에 속하는 탑이다. 땅 위에 자연석에 가까운 바닥돌을 깔고 그 위에 같은 돌로 너비를 좁히면서 3단의 기단(基壇)을 만들었다. 탑신(塔身)은 네 귀퉁이에 위로 오를수록 좁아지는 형태의 기둥 모양을 새겼고, 그 사이에 긴 판돌을 세워 면을 이루게 하였다. 동서남북 사면에 감실모양이 있는데, 우주와 면석의 약화된 모습으로 보는 경우도 있다. 감실은 목탑에 많이 나타나던 것으로 불상을 모시는 방을 의미한다. 석탑에서는 대부분 이를 형상화하는데 그쳐 모양만을 새기는 정도이다. 고려시대에 만들어진 석탑으로, 전체적으로 탑신의 몸돌이 높고 지붕돌은 지나치게 넓어 안정감이 없어 보인다. 정림사지오층석탑을 모방하였다고는 하지만 조형감각이나 수법에서 훨씬 떨어지는 작품이다. 1931년에 탑신 1층의 몸돌에서 상아불상, 목제탑, 다라니경 조각 등이 발견되었으며, 1962년 해체 수리시에는 2층에서 지름 7㎝, 깊이 12㎝로 사리를 두는 공간이 둥근 형태로 발견되었는데, 그 안에 41개의 사리가 들어있었다. 이 유물들은 모두 국립부여박물관에 보관되어 있다. 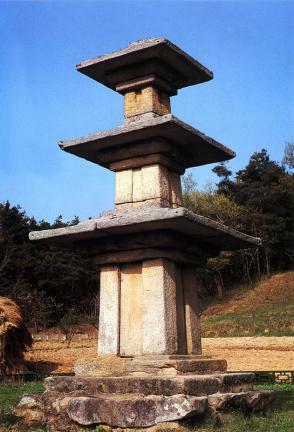 The Baekje-style three-story stone pagoda in Jangha-ri, Buyeo-gun appears to have been modeled on the Five-story Stone Pagoda at the Jeongnimsa Temple Site, Buyeo (National Treasure No. 9), which is situated in the former territory of the Baekje Dynasty comprising Chungcheong and Jella Provinces. 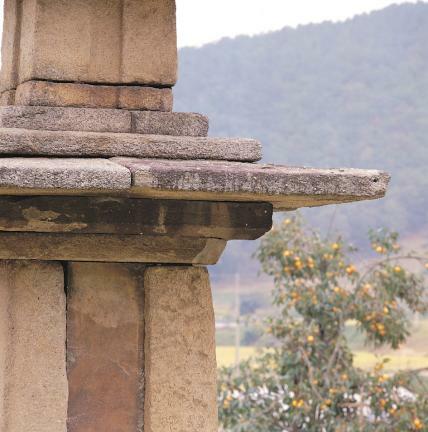 The main body of the pagoda is placed on a three-tiered stylobate which is hewn from a single stone laid on the foundation. The four corners of the main body are engraved with pillar patterns, which taper upward. 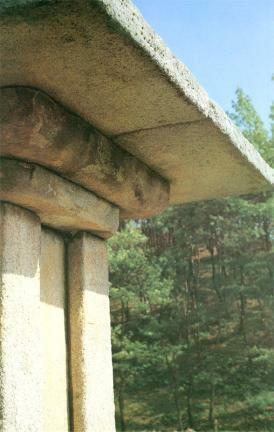 The core stone of the first story is composed of long, slim stones. The four sides of each story are engraved with a niche design. Wooden pagodas usually have a niche for housing a statue of the Buddha, while stone pagodas are usually just engraved with a niche design. 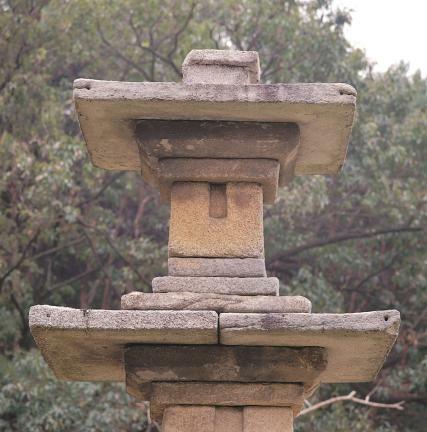 Built during the Goryeo Dynasty, this pagoda appears to lack stability due to its high core stones and the excessively wide roof stones of the main body. 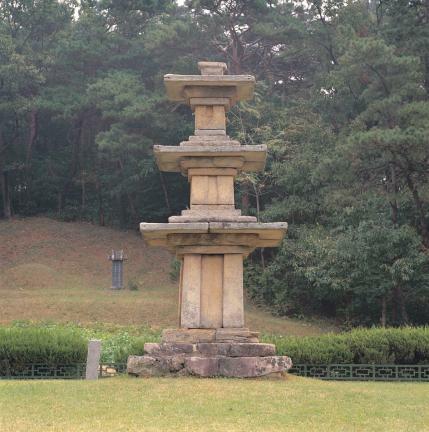 Although the pagoda follows the overall style of the Five-story Stone Pagoda at the Jeongnimsa Temple Site, its structure and the techniques used are inferior to it. In 1931, an ivory Buddha, a wooden tower and various fragments of the Dharani Sutra were found in the core stone of the first story of this pagoda. Thirty or so years later, during repair work carried out in 1962, a round space (7 cm in diameter x 12 cm in depth) for enshrining the sarira, containing 41 sariras, was discovered. 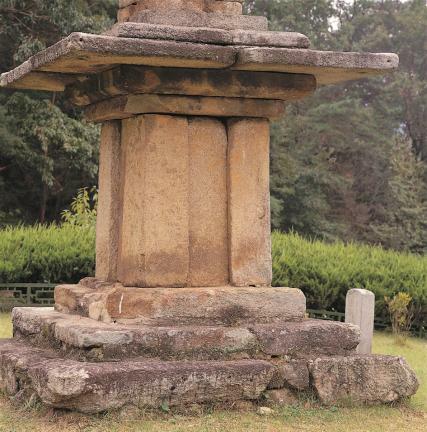 All the relics found at the pagoda are now kept at Buyeo National Museum.